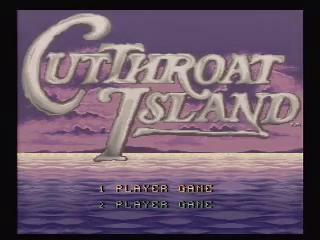 Cutthroat Island is a movie tie-in side-scrolling action game released in 1995 by Acclaim Entertainment. The game features two playable characters, two different fighting styles and is notoriously difficult. The player is cast in the role of a renegade treasure hunter, where they must battle through 10 levels encountering various foes such as Pirates and 1600s-era Redcoat soldiers. Best 100% time: 0:14:29 by Josh 'Funkdoc' Ballard on 2012-04-07. Unlike many of the more obscure games I speedrun, I never played this as a child. I had known about the movie this game was based on and how it lost even more money than Waterworld, and when I saw a copy at an Exchange for a few bucks I jumped right on it. I randomly played it on Team Spooky's stream, people enjoyed my failure to get past stage 2, and my interest picked up from there. 100% here means collecting 5 treasure chests hidden throughout the game. It doesn't add that much time over any%, and the locations of the chests aren't widely known - the GameFAQs guide doesn't even have them! This game is a beat-em-up which throws in autoscrollers and platforming levels, as well as a mazelike level. Though these are annoying when first playing this game, I found myself getting most fed up with the beat-em-up stages. This game was made by the same team as Maximum Carnage, but while that game had a lot of fun and interesting techniques this one has none. Grab attacks are slow and not damaging enough and all of your "special" moves are worthless, reducing this game's combat to either mashing out slash combos or spamming crouch stabs. This game is full of enemies who love to block and dodge your attacks, but the crouch stab mostly prevents that for whatever reason. Level 1 - One of the more random and annoying ones and the source of most of my resets. Gun-Axe Guy makes a couple more appearances, but the infinite combo you see here usually works on him with the right timing. Fun With Minecarts - Where most people who played this game gave up. An autoscroller that's pure memorization, you actually can gain or lose some time here depending on whether you hit all the downward slopes. "Spittalfield" - Another big cause of resets, due to some annoying enemies such as the fat guys and the drunken Peg-Leg. The gun I pick up has 5 shots, and the bosses can block them. Autoscroller #2 - A true autoscroller in every sense this time. The cannonballs are instant death, but if you stay at the bottom part of the carriage they can't hit you. "Harbour" - Remember level 1? Yeah. Mutiny - The last annoying beat-em-up level until the end. Everything described above meant I reset quite a bit here as well. Jungle - The mazelike level I mentioned earlier, and also an annoying treasure chest. It's rare that I don't die to the leopard there, and it doesn't cost that much time. Cliif 1 - Now the game starts getting interesting, as these next few levels took quite a while to figure out and are what make this game a better watch than your average beat-em-up. This route isn't immediately obvious when you first play the game, and the same is true for the other platforming levels. This is also where we see the first death skip - you die if you fall too far, but not if you're invincible, and dying makes you invincible for a pretty long time! This one just barely works and it saves around 6-7 seconds. Treasure Chamber - Hands down the most obnoxious level the first time you play this, but it became rather fun for me once I optimized it. There are lots of cool skips (yes, every death is intentional) and not-so-obvious routes, and I'm particularly proud of that damage skip to the treasure chest room. And yes, falling onto spikes doesn't kill you but falling onto the floor there does - a video game first? Cliff 2 - There is a useful death skip here as well, but it bypasses the treasure chest room and is only good for any%. As is, this level is all routing...and not randomly getting short jumps on the vines to the treasure chest. I still don't understand why that happens. And don't you just love that level exit? Cove - Normally, by far the cheapest fight in the game even though you don't have to kill the leopard. However, the strategy you see here is fairly consistent and I was thrilled I figured it out. I had nothing here before! Sea Battle - Mutiny Part 2, essentially. Kinda disappointed I died here but I just wanted the 1CC! RNG hell, and probably the place to look if you wanted to improve this run for some ungodly reason. Sadly, I don't know of a better strategy for Dawg Brown, but I think that's a rather fitting way to end the game anyway. Enjoy the true ending, it's definitely...a thing. Thanks to SDA and SRL, Polarity for constantly bugging me to play this, the Renny Harlin/Geena Davis duo for this game existing, and all my stream viewers for getting me through the awful combat! If you're interested in more speedruns of obscure and classic retro games, follow my stream at http://www.twitch.tv/srkfunkdoc !